We have heard from our PowerApps makers that in creating apps, it is difficult to track down errors, and to figure out how to solve them. We have also heard that it is hard to understand what needs to be done to create an accessible app. 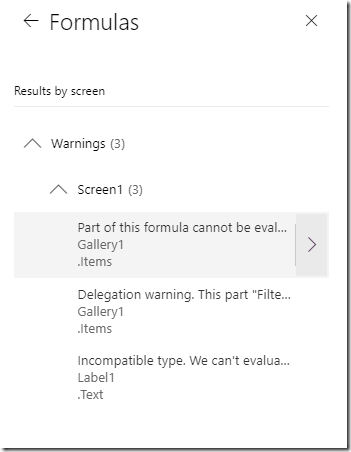 The App checker is now available to help provide a clear list of formula issues in your app, and to provide items to fix to make your app accessible. 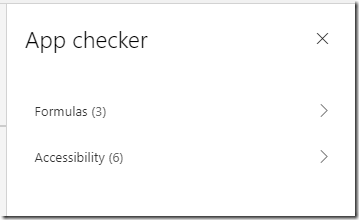 The App checker is an area that the PowerApps team will continue to invest in, and build on in order help to make debugging, performance and best practice decisions an easier and more guided experience. There are two ways to launch the App checker for formulas. The first way is to select the App checker button in the upper right corner of the PowerApp studio. This will launch the App checker where you can inspect Formula and Accessibility errors, warning, and tips. Choose the Formulas chevron to drill into the list of all the errors and warnings for your app. And, choose the chevron on the error to see additional details. Note that this details pane doesn’t currently offer many additional details. We are currently working on adding more details for causes and “how to fix” suggestions for all errors and warning. The second way is to double click on an error or warning indicator directly on the canvas. This short cut will take you directly to the error or warning in the App checker list. 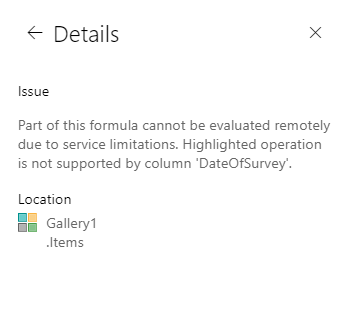 A single click on the error or warning indicator will still simply bring up the property in the formula bar. A red dot will show on the App checker button if there are formula errors in your app. The red dot does not appear for formula warnings, tips, or accessibility issues. Previously we showed errors with a yellow hazard triangle and suggestions as blue dots. We are moving to a more standard way of describing issues as shown in the chart below. The big change is that delegation issues were previously classified simply as suggestions. They are now classified as warnings because of the potential for data loss. 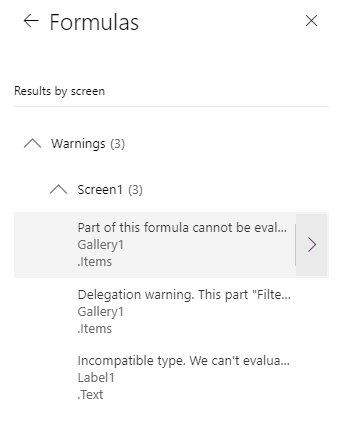 For example, if a Filter statement has a delegation warning it means that you may not get all your data, or even any of your data. And, if there is an assumption in your application that you have all the data from your data source, then your application could be wrong. Blue dots now represent Tips as is standard practice. The accessibility checker works similarly to the formula errors in that it checks your app for any instances where there are potential accessibility concerns and then provides a list. 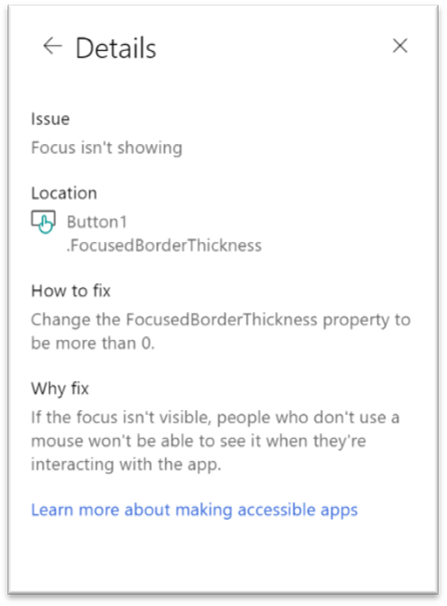 The accessibility checker currently provides guidance for achieving keyboard and screen reader support for apps, however it cannot detect color contrast issues yet. Selecting the item in the list will open the appropriate property for fixing the issue. After selecting the right chevron, the details will have a bunch of helpful information in addition to a link to more information on how to make accessible apps. 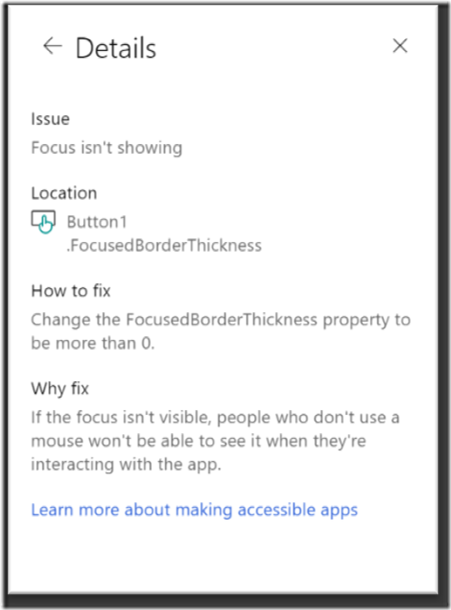 You can read more about the accessibility checker and accessibility in general in our creating accessible apps documentation. Let the PowerApps team know what you think of the App checker in the comments below, and on the PowerApps Community forums.